One of the advantages of moving is that it provides you the perfect opportunity to go through all of your belongings and downsize! Deciding what you absolutely need to keep and what can be tossed or donated helps cut down on the number of boxes you have to move to your new place. Plus it will mean a beautifully organized, clutter-free living space. 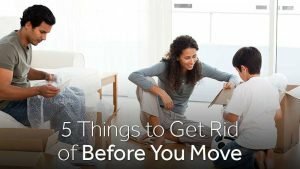 If you’re not sure what you can do without after your move, here’s a list of items you might not need when you get to your new home. Go through your closets and dresser drawers to pull out items of clothing that either no longer fit or you never wear. If they’re in good condition, you can donate them to a local nonprofit. Anything that’s ripped, faded and stained should go in the trash. If you have books, DVDs or other items that you borrowed from friends or family, make sure you return them before moving. While it’s easy enough to pack them with your stuff, these items take up unnecessary space. You’re also more likely to forget about them the longer they’re collecting dust on your shelf. There’s a good chance you have items in your kitchen that you don’t use or aren’t in great shape. Go through all of your cupboards and get rid of kitchen gadgets you never use. You should also go through your kitchen utensils and toss any that are in bad shape. If you feel bad about throwing things out, see if you can’t donate them or find a friend who could put your old blender to good use. Books, magazines and other papers tend to pile up around your home. Remember, the goal here is to cut down on the clutter, not bring it with you. Give away books and magazines if you can and recycle the rest. Just be careful with old receipts, bills and any documents you don’t need. 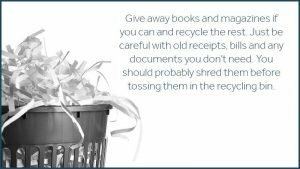 You should probably shred them before tossing them in the recycling bin. If you have food items lingering in your fridge and pantry before you move, consider donating anything that’s still edible. While food items should be fine if you’re moving somewhere close by, they won’t fare well on a move out of state or across the country. One way you can prevent having this issue is by being conscious of your grocery shopping in the weeks leading up to your move. Only buy things you can use right away. After you’ve gone through all of your stuff, if you’ve found things you simply can’t part with but don’t want to bring to the new house right away, remember that Zippy Shell of Columbus has storage options for every budget! We can also help you pack up and move if you’d rather save all that hard work for someone else. Whether you’re looking for a place to stash your stuff or a friendly company to help you with your move, give Zippy Shell a call and we’ll give you a free quote. Just so you know, we’re currently offering length-of-stay promos on all 15-foot storage containers to help you save money! No matter what if you book now you’ll score a regular web discount for one month, which results in a cost of $159. If you reserve a container for three or six months, you’ll receive $40 off the base price for a total of $149. Those who sign up for six months will also get 50 percent off content protection, which is a value of $10.